How Can One’s Wishes Be Fulfilled? Rinpoche at New Year’s blessing, Singapore. Lama Zopa Rinpoche at ABC, Singapore. Question from Dharma students: How can one’s wishes be fulfilled? How can one transform the power of prayer into the power of activities? Rinpoche’s reply: In daily life, one thing is the practice of kindness towards others, human beings, animals, or any other living beings, to help those in need. Sincerely, from the heart, we help others’ wishes to be fulfilled, whether human beings or animals, whoever needs help. They have a problem, so you help. If an insect is drowning in the water, you take it out, you help it, so you cause that being’s wish to be fulfilled. Or maybe there is an old man walking along who needs help, there is a problem or maybe some danger, so you help. Whether it is big or small, whatever help somebody needs, you try to give it. Like someone needs to know how to get to a place, for example, so you explain how to get there and it helps that person’s wish be fulfilled. Anything like that, whether it’s small or big, we help in whatever way we can. If you can’t help, you pray and dedicate the merits for that person’s wish for happiness to succeed now. Serving other sentient beings is one cause, because it makes their wishes be fulfilled. A consequence, a result of that karma, is that it fulfills your wishes. As a result of that, whatever wishes you have are fulfilled. Whenever you have some wish, other people help, even sometimes without you needing to ask, you receive help, and your wishes just happen like that. The most powerful way is serving the guru, fulfilling the wishes of the guru; that is extremely powerful. Even if you do very little, the object is so powerful. Also, from the smallest act performed with this life’s parents, the karma is very powerful; the good karma is so powerful that you start to experience the result in this life. There are three types of karma: karma that you create in this life and see the result of in this life; karma that you create in this life and experience in the next life; and karma that you create in this life and of which you experience the result after many, many lifetimes, many eons. Those are the three types of karma. The smallest service offered to your parents brings very good karma. It is very powerful, you see the result, and have success in this life. That doesn’t mean only in this life, it means in many, many future lifetimes. In a hundred thousand lifetimes you experience the result: success and happiness. And if the smallest disrespect is committed with your parents, the negative karma is very powerful, because parents are very powerful objects. … Ordained monks and nuns are more powerful objects than parents. More powerful than them are arya beings, those who have wisdom directly perceiving emptiness, and arhats, who have completely removed delusions and karma, are free from samsara, and so are more powerful. Between numberless arhats and one bodhisattva, one very new bodhisattva who just generated bodhicitta, the very new bodhisattva who has just generated bodhicitta is much more powerful than numberless arhats, as far as the power of the object is concerned. … Now we should understand the positive aspect. If one respects a bodhisattva or makes offerings or offers service to a bodhisattva, one can imagine how powerful the good karma is; it is unbelievable. Between the numberless bodhisattvas and one Buddha, one Buddha is unbelievably more powerful than numberless bodhisattvas. Numberless bodhisattvas’ power is small compared to the power of one Buddha. Between numberless Buddhas and one guru, as powerful as these objects are, they are less powerful than one guru. One guru is much more powerful than numberless Buddhas. That means the guru is the most powerful among all the objects, starting from our parents in this life. How that person becomes a guru is like this: first there is recognition. As it is explained in Lama Tsong Khapa’s lam-rim, the definition of a disciple is, “One who relies upon.” The virtuous friend is the object to rely upon, so that is the definition: “object to rely upon, object to be devoted to.” That is the definition of the virtuous friend in the philosophical teachings and Lama Tsong Khapa’s Lamrim Chenmo. With the recognition of oneself as a disciple and the other person as the guru, one takes teachings. It doesn’t have to be a complete teaching of a text; it can be just a few syllables of a mantra or one verse. If one receives it with the recognition of oneself as a disciple and the other person as the guru, then the Dharma connection, the relationship of guru-disciple, is established. From that time, this person becomes the most powerful one in your life, more powerful than all the Buddhas. … Now you can see that the guru is the most powerful object. From such small services to the guru, the karma is the most powerful good karma; the merit you collect is the most extensive, you will start to experience the resulting happiness in this life, and in many lifetimes. Because of such incredible power, in the case of purification, the guru is the most powerful – bringing the most extensive merit and most powerful purification. You become that much closer to realization of the path, liberation, and enlightenment. That means you become closer to enlightening all sentient beings: the ultimate goal of our life, liberating them from the oceans of samsaric suffering and bringing them to enlightenment. Obeying every single piece of advice given by the guru, every time you accomplish it, so much negative karma is purified, and you come closer to liberation, enlightenment, and to enlightening all sentient beings. For example, cleaning a room or a house where one’s spiritual master, the guru, is staying becomes unbelievably powerful purification, and each time you clean away the dust, so much negative karma is purified, you accumulate so much merit, and become closer to realization and enlightenment. You become closer to realizations each time, then closer to liberation, and closer to enlightenment, which means closer to enlightening all sentient beings. The most powerful thing is obeying the guru’s advice, then offering service and respect to the guru, and, lastly, if one has material goods, making offerings to the guru. You collect the most extensive merit with the guru. Whatever offering is made, even a very small object, you collect the most extensive merit. That makes it so easy to achieve realizations and to develop the mind in the path to liberation and enlightenment. More merit means it is easier to achieve realizations and enlightenment. … So how can one fulfill one’s wishes? The most powerful way is obtaining the guru’s advice, offering service, and making material offerings. However, the main thing is pleasing the holy mind of the virtuous friend. The other thing I mentioned is serving sentient beings, helping with whatever they need … The third thing is making prayers, such as praying to Medicine Buddha for wishes to be fulfilled and success. You pray to Medicine Buddha for everyone to fulfill their wishes and have success. 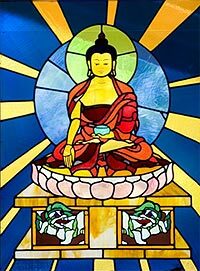 Reciting Medicine Buddha name mantra is very powerful. The other answer is that obstacles come from negative karma, and negative karma comes from delusions, from ignorance. To fulfill one’s wishes, there are two ways to do this. In essence, one method is to purify the negative karma already collected, which brings obstacles, by practicing purification. The other way is to collect merit. The cause of success is merit and good karma. Success is what we want, not suffering. The cause of happiness is only good karma, merit, so we need to collect merit. The Heart Advice for Death and Dying homestudy program, which contains a book of commentary by Rinpoche and audio CD recorded by Ven. Sangye Khadro, is now available. Note that in late March, a program for centers structured around Heart Advice for Death and Dying will be made available! This program will include a five-session course outline with meditations and study materials. 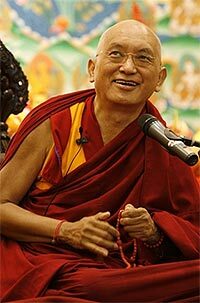 It will be accessible via the FPMT Only page on the Foundation Store. 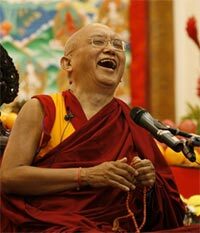 Please note: much of the advice on death and dying has been updated and rearranged on the Lama Zopa Rinpoche’s advice page. Of special note is Rinpoche’s advice for how to assemble a death box for your center or home. NEW! Escaping Your Inner Prison is an audio CD of Rinpoche teaching the entire path in 70 minutes to a group of women prisoners in Australia, 2003. The CD includes a PDF transcript to facilitate your listening. Sutra of Golden Light in Nepalese, translated by Punya Parajuli. Essence of the Heart Sutra by His Holiness Dalai Lama in Vietnamese, translated by Anh Ho. We are looking for a translator for a book about Manjushri Mountain in China. As advised by Rinpoche, this will be part of a new pilgrimage series Education Services is producing on India/Nepal, Tibet, and China. You can help us accomplish this task by donating to the Education Translation Fund or by referring a translator interested in this project. Screening at the recent Berlin Film Festival was “Unmistaken Child,” which documents Geshe Tenzin Zopa’s four-year search for the reincarnation of his teacher, the remarkable late mahasiddha, Geshe Lama Konchog. It was one of only 48 productions selected for the prestigious Festival’s “Panorama” showcase of arthouse and independent films. they had seen. Geshe-la who attended the Berlinale with the director, Nati Baratz, took the opportunity to share the Dharma and the message of world peace and compassion with the film buffs, industry insiders and press present, and found his trip to Germany very meaningful. In the meantime, you can search for “Unmistaken Child” on the web or view the trailer on YouTube. 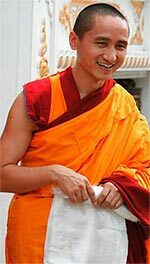 In January 2006, the young tulku, Tenzin Phuntsok, was formally recognized as the reincarnation of Geshe Lama Konchog by His Holiness the Dalai Lama. Part of the Dharma income had gone to sponsoring some of the large stupas and prayer wheels at the Garden of Enlightenment, and applications have been received from students committed to making the 9th Annual Mani retreat a success. The Chenrezig community is dedicated to creating the conditions for Rinpoche to join them for their 10th Annual Retreat in 2010! Not for the first time, there was a report of Lama Tsong Khapa’s relic in the Maitreya Project’s Relic Tour emitting light. This time it happened while the Tour was in Japan. Despite the limited publicity, the Tour attracted a good crowd. Besides receiving the blessings of the precious objects, those at the opening ceremony were treated to the chanting of the Heart Sutra in four languages – Pali, Tibetan, English, and Japanese. And there was a local expert on relics to demystify the subject of holy relics for the curious and believers alike. 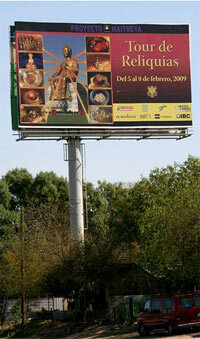 The Relic Tour in another part of its worldwide journey – in Nuevo Laredo, Mexico! Opportunities include volunteers for Root Institute in Bodhgaya, India, work opportunities at O.sel.ling Retreat Center, Spain, and volunteer positions at Jamyang Buddhist Centre, England.